Food Blogga: It's Time for Cooking to Combat Cancer, Round 3! It's Time for Cooking to Combat Cancer, Round 3! 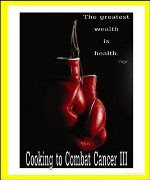 Cooking to Combat Cancer III is back! That means my friend Chris of Melecotte is celebrating her third year of being cancer-free. Now that's something to cheer about. If you know Chris, then you know that she's a special person. Words such as generous, humble, funny, and caring come to my mind when I think of her. So won't you join me in marking Chris's milestone? All you have to do is submit a recipe with cancer-fighting ingredients to Chris by Wednesday, April 29, 2009. See details here. I'm submitting a healthy, cancer-fighting Mediterranean dish that I think Chris will enjoy. 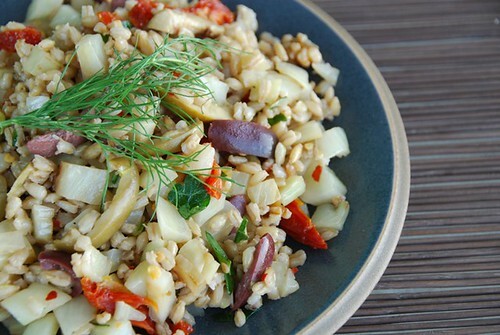 My Warm Barley and Fennel Salad is highly textured, aromatic, and flavorful; enjoy it as a main meal or as a side dish with grilled fish or meat. It's made with high fiber barley, antioxidant-rich vegetables, and heart-healthy olive oil, so your body will be happy. In a medium saucepan bring water to a boil. Add barley; return to a boil for 2 minutes, then reduce to low, cover partially, and cook for 15-20 minutes, or until tender. If water evaporates, simply add a little more. In a large skillet over medium-high heat, warm 2 teaspoons olive oil. Add diced fennel; saute 5-7 minutes, or until lightly browned and tender, but not mushy. In a large bowl, add cooked barley, fennel, sun-dried tomatoes, olives, and walnuts; toss lightly until well blended. In a small bowl, whisk olive oil, balsamic vinegar, water, lemon juice, lemon zest, parsley, crushed red pepper, and salt. Pour over the barley mixture and toss until well coated. Taste it and adjust seasonings accordingly. Garnish with additional fresh parsley, if desired. Enjoy this salad warm, at room temperature, or chilled. It tastes even better after a day or two and makes excellent leftovers. Susan, such sweet words! Thank you so much. ;) This salad looks awesome. I just bought fennel today. Wonder if I still have that barley in my pantry? Thanks for participating in year 2 of CCC! You're the best! nice recipe and such a great post. I haven't cooked with barely before. But put fennel, tomatoes, olives and the like in it, and I know it is good. What a wonderful book and cause. I have become quite a fan of barley recently. It is so versatile in soups, salads and casseroles, and so satisfying. Wow Susan this seems to have all kinds of wonderful flavors: olives, fennel, lemon and I really am always looking for new ways with barley. This should be a lovely summer salad. Love Barley & Fennel. Very Healthy salad for a very good cause. My mom is a seven year lung cancer survivor...two years longer than the norm...wahooo! I'll have to see if I can enter this. I think Chris's event is so great! Your Mediterranean dish looks amazing; what fabulous flavors. Great job! Well written Susan...Chris is certainly a wonderful person! love this side dish; the flavours & the ingredients...very fresh & exciting! I'm definitely trying your recipe--every recipe I've made of yours has been a winner-& I've made them over & over again. Really. Diet & disease prevention is my all-time favorite subject. Delicious food is my second. Articles like the one that follows continue to inspire me to keep eating all those healthy vegetables & grains. "The knowledge that some cancers can spontaneously regress is an incredible motivator to continue to modify my lifestyle. For example, Servan-Schreiber details the top foods that inhibit breast cancer cell growth: garlic, leeks, scallions, brussel sprouts, cauliflower, cabbage, & kale." Here's to good food & good health. Thank you Susan for wedding the two. Congrats and best wishes for continued good health to Chris. I love fennel and I bet it tastes amazing in this dish. Yum! I am glad to hear your friend is cancer-free. I wish you a very healthy life from now on. Your salad looks great! I make up salads similar to this whenever I have wheat berries or barley in my pantry. Never tried adding fennel to it but will next time. Thank you for the idea. That looks so good! I am definitely going to submit a recipe! chris-You are so welcome, my dear! nicole-I'm sure you'll love it. tw-It really is versatile, plus I love the texture. michelle-I'm glad to hear you're submitting! somea-I'm glad you like it. motorhome-That's terrific! Thanks for visiting. healthylibrarian-Chris is an inspiring person. Thank you so much for your kind words. I truly appreciate it. dragon-It's one of my favorite vegetables too. melomeals-Yea! Glad to hear it. Somehow I missed this post and am so sorry on many levels. Learning about Chris touched my heart and I wish her a long a healthy life. I love your salad. Warm... fennel... barley! I love barley and will make up a batch of the hulless variety just to have in the fridge for tossing into salads or fritattas. Your recipe is another one for my files.